So last night I threw together a little Spicy, Sweet & Sour Chicken for dinner and obviously wanted to keep things rolling in an Asian direction… So I decided to make some Soy Glazed Potatoes on the side. I’ll be very honest, I was worried about these. I was afraid they would come out either super salty, or super cloying sweet, or burnt! Well, they were none of the above, they were delicious! Toss the diced potatoes with the olive oil, salt, pepper and garlic powder. Place them on a lightly greased baking sheet and bake in the oven for 30-35 minutes, they should be browned on the outside. While the potatoes are roasting in the oven put the soy, honey and brown sugar in a small sauce pot and heat on medium-high, stirring regularly. Bring to a simmer and cook for 3 minutes to reduce slightly, still stirring regularly. Once done set aside at room temperature to cool. Once the potatoes are browned take them out of the oven and put them in a large bowl. Pour the soy glaze over the potatoes and toss them until evenly coated. Put the glazed potatoes back on the baking sheet and cook in the oven for an additional 10 minutes. That’s it, you’re done. 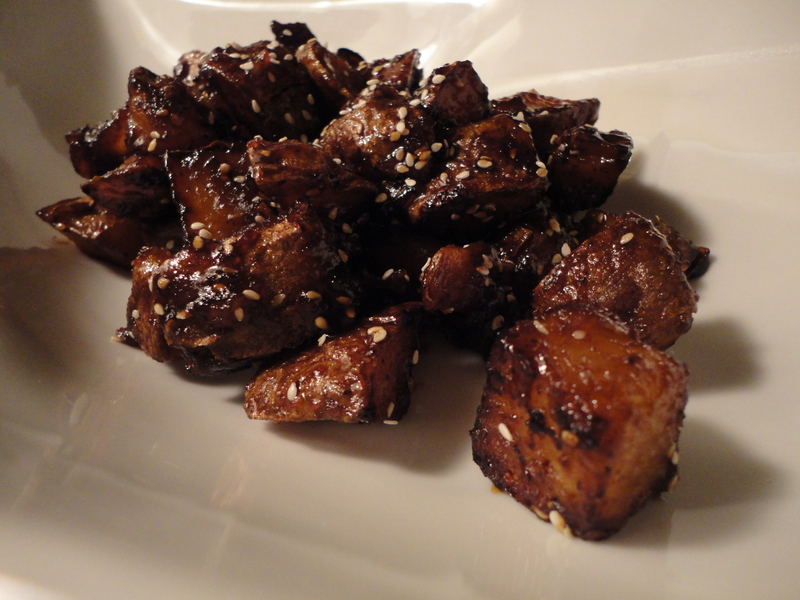 Plate the potatoes and sprinkle them with the sesame seeds… then go ahead and start eating. Enjoy! Tags: asian, baking, brown sugar, cooking, honey, perfect pairings, perfect pairings at home, potato, potatoes, sesame seeds, sides, soy. Bookmark the permalink. NOW you’re speaking my language! I love Asian flavors and I am probably going to turn into a potato one of these days. Pinning this now to make later on this week.